Hello friends, we are back with super blasting offer, by which you can earn free bookmyshow movie vouchers absolutely free. After Snapdeal & Flipkart Refer and Earn Program This time Quiker come up with refer and earn program. As you all know lots of new movies coming closer and closer day by day this is a super duper offer, go fast and grab this deal before its expired. Open the App and Register your account. Goto Menu >> Refer and Earn and copy your Referral link. 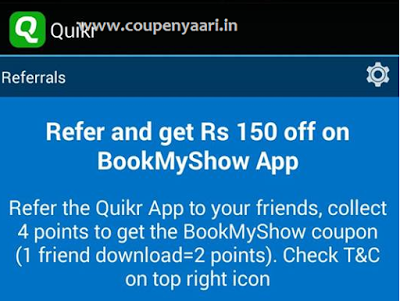 Once your friend download and Register on Quikr App using your Referral link, you will get your Referral bonus. You’ll get maximum 8 points by referring 4 friends. Remember, you get points only for new downloads. 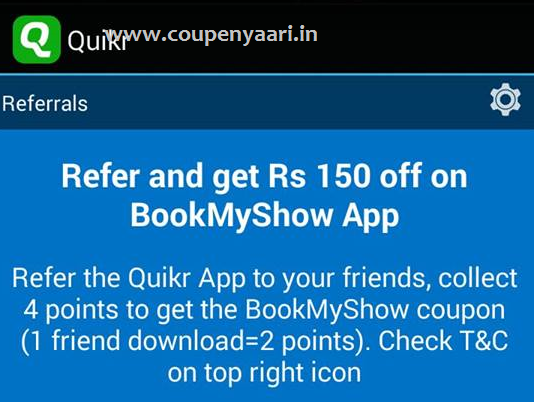 If your friend is already using or earlier has used Quikr App before, you wont get any points.